So much in the world seems to be getting more angry, more violent, and more hate-filled these days. It’s uncomfortable and worrisome. What on earth can a person do to counteract all that? Developing a better, kinder, gentler way of dealing with others would surely be helpful. But how? And while still maintaining one’s own individuality and boundaries? 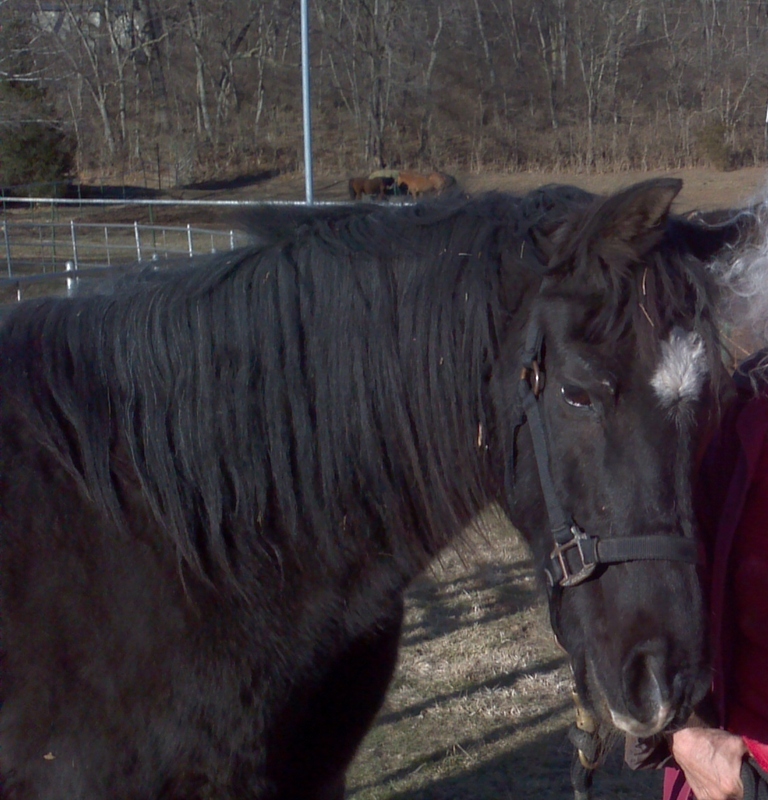 The horses, through our relationship with them, have some answers for us. I realized yesterday that I’ve been developing a gentler way of relating to Midnight for some time now—several years, actually. It probably started when I quit riding him, and came on gradually without my noticing; but our way of interacting now is more like friends, not like owner and animal or whatever. Midders bangs on his stall door to get my attention while I’m hanging out in the pasture across the lane with Galahad and Dancer. Since it’s Galahad’s day off, I have time to take Midnight out for a walk, so we get his halter on and head out the door. He wants to go directly down the road, but I need to stop at the car for a couple of things. I ask, and he’s willing to come over there with me. After all, there are cookies in the back, right? After a few minutes (and some video) we start off down the lane toward the barns. He has a pattern that he likes to do, but we negotiate a couple of changes, since one of his favorite grazing areas is still muddy. He easily takes the redirection—there are good patches of clover elsewhere, after all. After ten minutes or so I suggest we head up toward the main barn, and he says, “Sure!” and takes off at a clip. When I say “suggest,” I actually mean this: “Midnight, shall we go over there” (I point to the barn) “and see what’s going on?” No pressure on the lead rope—just words, body language, and intention. He looks where I’m pointing and trundles off in that direction. He gets to choose the pace and direction of his walk, for the most part, and he has certain places he wants to check out. I just hold the lead rope in order to keep it from dragging. There’s lots of stopping and sniffing and grazing. Once in a while, if he decides to go sniff noses with another horse, I might tell him no and put the slightest pressure on the rope, but generally he’s OK with just the sound of my voice. One of his must-check spots is the cement area under the grain bins—there’s usually some spilled grain there, and he likes to mop it up. Today, though, it’s pretty moldy-looking because of all the rain recently, so there’s no way I’m going to let him eat it. This results in a little bit of a tussle, but not much. He’s not buying my explanation, but he understands that I’m serious, so he’s willing to leave after only a little pulling. And I do mean a little bit—Midders may be small but he’s mighty, and when he gets stubborn with that head of his, it’s not easy to pull him away. This discussion was still in the range of a few seconds of mild pressure on the lead rope. Then we headed over to the mares pasture to see “his” girls, who all came over to the fence and grazed along with us for a while. It was getting late, and I had errands to run on the way home, so after a few minutes I suggested (with words and body language, not the lead rope) that we head back home to his place. Surprisingly (to me), he picked his head up at my suggestion and off we went. Along the way Midnight’s buddy Nick was returning horses to their stalls after turnout. Midders, seeing Nick, insisted on taking a detour to say hi. After a greeting and a little conversation (and a couple more stops for especially nice patches of clover), we headed back down the lane at a good clip. He seemed as happy to go home as he had been to go out in the first place. This has been our routine for the last few years, and I hadn’t thought much about it. There just isn’t any drama any more with Midnight—we go and have our walk and chat a little bit, then go back home. But something about it caught my attention yesterday, and I realized just how amazing (for me) this lack of drama is, and how different my mindset is when I’m with Midders. Midnight isn’t in training for anything. I’m not going to ride him, and there aren’t any expectations. When I’m with him, I’m just out to enjoy his company and have a good time together. There’s no agenda; I’m not hoping to get any certain behavior from him. We’re just walking together like the old friends that we are. No agenda…no drama. Wow…ya think there might be a connection? THIS is what Paulette Evans at Ribbleton Attunement (whose online courses I’ve been taking lately) is trying to teach us to do! And it’s SO HARD! Yet I’m doing it on my own with Midnight, effortlessly, without thinking about it. HAVE been doing it for a few years now, actually. But it’s a mindset that I clearly do not have with Galahad, and that’s the rub. I DO have expectations of him, and hopes, and desires…. So my challenge is to see what I can do to get to this place of quiet non-expectation with my Best Boy, and see what develops from there. And also, I’m thinking, with my human friends. The fewer expectations I have with them, the more quiet curiosity and friendship I can develop, the less drama and the more satisfaction. Will that help the world? Dunno…but it should make my life more peaceful. The Little Black Horse Who Could…. Our wonderful Midnight Dancer has had quite an adventure this last several weeks: One Friday morning at the end of October, Midnight broke his left elbow in a freak accident with another horse. Every vet in three states told us the same thing: Put him down, and do it quickly. There’s no way he could possibly survive this. Midnight himself had a different idea. His energy was still bright, and though he was clearly in some pain those first couple of days, he wasn’t distressed by it, if that makes any sense. He continued to hobble around his stall, eating everything we put in front of him and keeping an eye on what was going on around him. He very clearly let us know that he was NOT ready to go to his Long Sleep. But those Voices of Authority: It’s always so very difficult to argue with them, to make any sort of case for something different. I went through the struggle a couple of years ago when Galahad had abscesses in both front hooves and “They” insisted I needed to put shoes on him. This time was even worse, because the question was really, literally, about life and death. I was pretty well stuck, unable to speak up for Midders as his owners and I struggled with the decision. Two friends of mine (and Midnight’s!) helped move me from my stuck place. 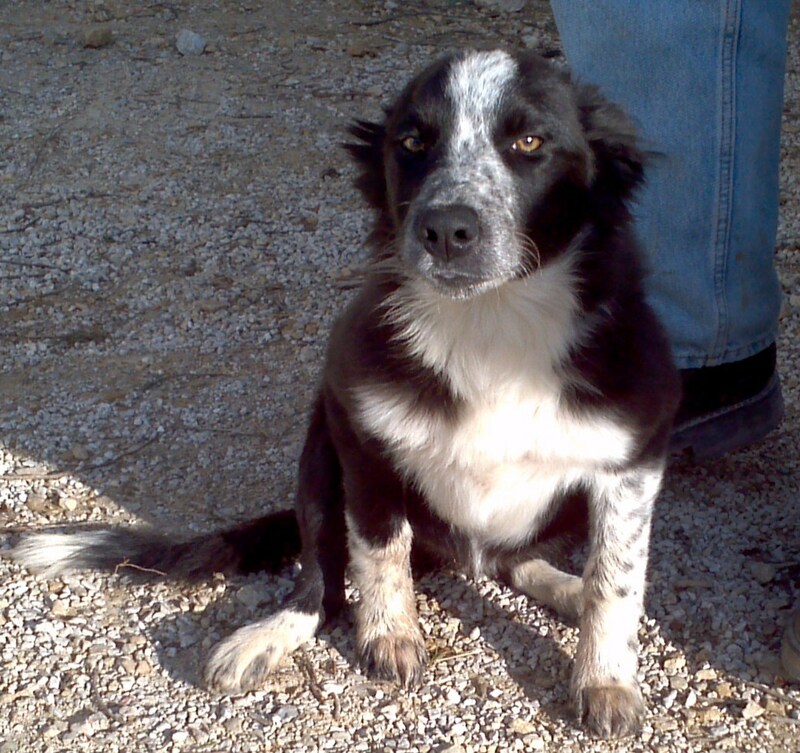 First was “Elwood,” the head caretaker and ranch hand out at the barn. He’s been there for thirty years, and I swear he’s half horse by now. A gentle soul with a huge heart and strong intuition, he urged me to let Midnight have a chance, to just wait and see how he progressed. That brought me back to my senses and gave me the courage to speak up strongly: “We need to give him a chance. He will tell us when and if he’s ready to give up the fight.” His owners, thank goodness, agreed. Fortunately, our regular vet Dr. H. was willing to work with us, though he was pretty certain what the outcome would be. So in the short run, we bandaged and splinted Midnight’s leg, and put a boot on the good foot to support the hoof and keep him from foundering on that leg because of the extra pressure. The first several weeks were rough. 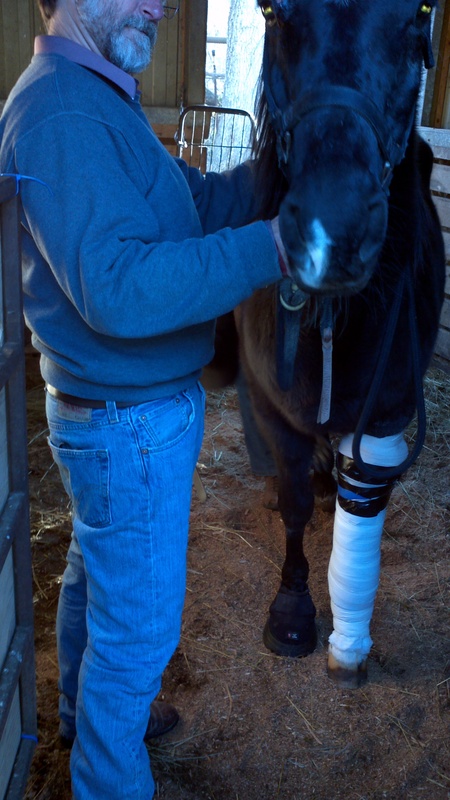 Midnight was able to hobble around, and shortly, to walk around on his splinted leg. He never seemed distressed — his temperature and respiration remained normal the entire time. The problem was mechanical: He kept shifting the aluminum splint, probably by lying down (! ), and every time it shifted, Dr. H. had to come out and reposition it. The bandage was way too complicated for us to do ourselves. Midnight required a lot of daily care, too. Because he was stall-bound and not able to move around, there was a danger that he’d become bored. He’s a smart little guy, very active and interested, who thrives on attention. He also needed extra feedings — he can’t eat hay, and needs soaked forage cubes in order to keep things “moving” and to stay warm in the winter. So we were kept busy tending to him every day. Eventually, Midders actually broke his aluminum splint. Needing a sturdy but lightweight alternative, we replaced it with one cut from PVC pipe. Success! He couldn’t break that one — but he continued to shift it every couple of days. Vet calls get expensive fast! We were pretty frustrated, but then we decided to try Gorilla Tape instead of the vet tape that we had been using. That did the trick. Finally, we could go four or five or even seven days without needing Dr. H. to come by. A month into the journey, Midnight began to develop pressure sores — an almost unavoidable consequence of the splint and bandage. Dr. H. was inventive and creative about the type of padding and the position of the splint, and that bought us just enough time: By Week Seven, it was clear that we had to remove the splint, whether the elbow was “ready” or not. We shouldn’t have doubted Midders. He quickly adjusted to the lack of support, and was able to put at least some weight on the injured leg from the very beginning. As long as he stood square, we were able to lift his good front foot to clean it and replace the boot when we needed to. It’s been almost twelve weeks now. Last week Dr. H. cleared Midnight for walking along the roads, and to begin to move around in a limited part of his paddock. And just in time, too: The day before that vet visit, Midnight had escaped his stall (he was READY to move!) and trotted off down the lane. It took a while to catch him! So our little miracle horse is getting back to normal. He’s going for a walk once or twice every day, assisted by the intrepid members of Team Midnight. All of his pressure sores have healed and he’s doing amazingly well. Midders has friends and supporters literally all over the world — through the wonders of Facebook and Carolyn Resnick’s network of students and trainers. We marshalled their healing energy and prayers, and I truly believe that they all share the credit for his wonderful recovery. In the next post, I want to talk about the conscious and careful way we asked for that healing energy: There’s a specific technique that I believe was instrumental in the healing process. Stay tuned — and visualize the Mean Little Black Horse trotting around, tail in the air, happy and whole!